1 Log in to the background of Sysview terminal management. In the Rights Management interface, locate the sub-account you want to audit. If there is no sub-account, you need to create a sub-account first, and then click the Edit button under Actions on the right of the sub-account. 2. In the dialog box, tick “Schedule Approval”. 3 Whenthepresentation content cannot be displayed on display terminal until it get approve from the group administrator and system administrator. 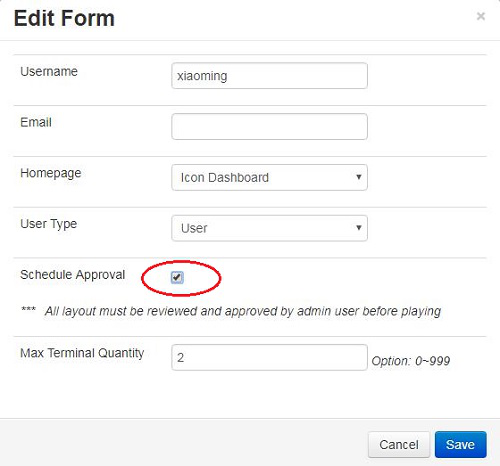 In this case, the administrator need log in to the terminal management, Click "Schedule Approval" in the "Administration" Button, find the sub-account, click on the right of the program "Actions" button below the "Approval Pass." The administrator can also click the "delete" button, to reject publish.